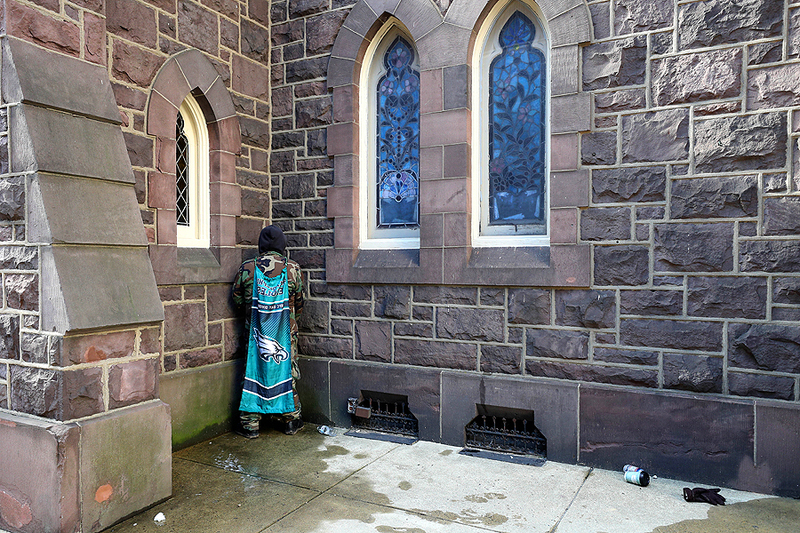 "A man draped in a Eagles flag urinates on the exterior wall of Living Word Community Church as fans celebrate with the Philadelphia Eagles during their NFL Super Bowl victory parade on February 8, 2018 in Philadelphia, Pennsylvania." After the Philadelphia Eagles defeated the New England Patriots in Super Bowl LII to win their first Super Bowl in franchise history...they had quite the party. On the ground covering the up and downs of said celebration can be quite the experience. Sober and drunk, loud and quiet, yin and yang. Just about every emotion one can think of, and it's opposite counterpart, is witnessed and on display when hundreds of thousands of fans (maybe even millions) gathered in the city to show their support. It's lawless to say the least. Do as you please. Climb on what you want. And even urinate wherever can find a place to go. Maybe it's because I've never been a die-hard fan of any team, but I cannot imagine acting outlandish like many Eagles fans did even if my favorite team did the unspeakable. It's also hard to process knowing many live directly in the city and it's where their children are raised. Nonetheless, as a visual witness to the shenanigans, there were no shortage of images in this super celebration.